Liberty had been outsourcing treatment since the 1980’s. Increasing and unpredictable outsourcing costs proved to be unsustainable. Liberty quickly determined that building their own treatment facilities would save users nearly a million dollars each year over the next 30 years. 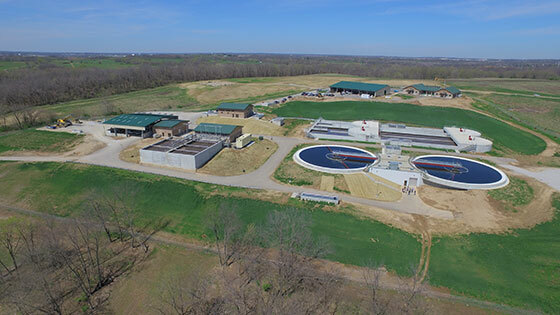 To maximize those savings and maintain user rates, they needed the treatment plant, force main, trunks sewers, pump stations, administration and maintenance facilities in operation as quickly as possible. Under design-bid-build arrangements, this would be over six different contracts and take over four years to complete. Everything they wanted was completed under one contract in two and a half years. Design-build delivery was the only option. The Liberty project was the first design-build of its type in Missouri and, in ways, the U.S. It is an example project used to successfully forge design-build legislation in Missouri. In utilizing a fixed-cost, performance-based structure with incentives, Liberty maximized the best of design-build for this project to resounding success. This project sets the bar where owners can maintain a fixed cost with performance based requirements while maintaining design control.